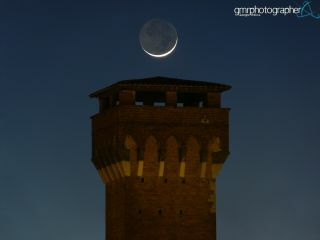 Giuseppe Petricca sent Space.com this image of the moon over a citadel near the Arno River, in Pisa, Italy on March 3, 2014. The moon rises with the brilliant glow of earthshine over a citadel along the Arno River in Pisa, Italy in these beautiful images recently sent to Space.com. Amateur astronomer and photographer Giuseppe Petricca of Pisa, Italy, took these images on March 3 as the 2.5 percent lit moon hanged low in the sky roughly one hour after sunset. Petricca used a Nikon Coolpix P90 Bridge on tripod (ISO 100, f5.0). Exposition times varied as the photographer adapted the shots to the incoming darkness. "Yesterday evening was surely an amazing one," Petricca wrote Space.com in an email at the time. The phenomenon called "earthshine" happens when sunlight reflects off the Earth and shines onto the moon. A crescent moon is between a new moon and a half moon.